I remembered seeing the film and that I probably liked it.I am 66 and desperate for entertainment. Good Clint but horrendous DVD mastering. BUDGET TRANSFER TO SAY THE LEAST! This film was widely acclaimed when it was release for its wonderful mountaineering scenes. They were state of the art at that time. Now, they are merely good. CLIFFHANGER has some better ones. Still, if you like that sort of thing, it is worth watching. It's also worth watching if you like secret agent, black ops types of films. I do but this one is not as good as many others in that respect. The story is of a retired government hitman who is an art professor. He is forced out of retirement to go after some people who assassinated a friend of his. All he is told is that one of the assassins will be taking part in the climb of Mt. Eiger in Switzerland. It is up to Eastwood to figure out who it is and "sanction" him. This film portrays a very bleak view of the US government. This not uncommon for films from that time. Basically, the mindset is that the US is no better than any other regime and probably worse. It's a fairly decent action film but will never rank among my favorites. My wife enjoys The Eiger Sanction far more than I do. I actually purchased the DVD for her. Although I'm quite fond of Clint Eastwood, there are many other movies I'd rather watch than The Eiger Sanction. The photography from the American southwest is vastly better than the part of the film photographed in Europe, in my opinion. And Eastwood did his own mountain climbing in The Eiger Sacntion. In his seemingly endless career, Clint Eastwood has directed quite a few movies, and acted in a helluva lot more. "The Eiger Sanction" may rank as the wierdest of all of these, and that's saying something. It's the not-so-short story of a semi-retired government assassin who is blackmailed back into service for one last job. Of course, "one last job" turns into several. And the last of the last involves a target whose identity is unknown to both Eastwood and his employers. 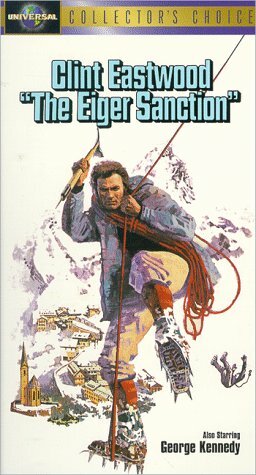 Cross a boilerplate international secret-agent yarn with a whodunnit, or rather a whoisit, mix in some Rocky-esque training sequences and top it off with a documentary on the wierd because-it's-there mountain-climbing culture, and you have "The Eiger Sanction." I knew after 5 minutes of watching this movie it had to be based on a novel, and not a particularly good one at that. It has the feeling of a by-the-numbers story punched up to "colorful" dimensions by a pill-popping hack writer, who deciced that making every character so wildly eccentric would make us forget they could all have walked right out of Central Casting with their per diem checks in hand. Take the names, for instance: Hemlock, Mello, Dragon, Wormwood, Pope, George (for a woman), and of course, Jemimah. Subtle, they're not. But I'm getting ahead of myself. Eastwood is Dr. Hemlock, the ex-assassin who now works as college professor. For a third of the film, Clint plays Hemlock as a fussy, smug, condescending, know-it-all who uses words like "involuted" and wears ridiculous 70's era eyeglasses. Then, about a half-hour into the film, he simply becomes CLINT EASTWOOD, guzzling beer, using words like "ain't" and abandoning the professor persona completely. I never did figure out whether this was intentional, meaning that Hemlock's collegiate personality was simply an act, or whether Clint simply couldn't summon the energy to play Hemlock as such an annoying, arse-puckered temple of repression and decided to play himself for the rest of the flick instead. To his credit, once Eastwood drops the smug, his character is a lot more likable and often very funny. Hemlock's boss is Dragon, a wierd albino who lives in a climate-controlled office(I'm not making this up). Dragon, we are told, used to work for the Nazis, and how he heads up C-2, a "deniable" gov't agency that "sanctions" various unfortunates who fall afoul of it. He blackmails Hemlock out of retirement by threatening problems with the IRS over Hemlock's art collection (I SWEAR I am not making this up). Then he sweetens the pot by saying that the mystery target is the guy that iced Hemlock's friend and mentor. Dragon also employs a hapless minion named Pope, whose main purpose in the film seems to be to get beaten up and humiliated by Eastwood. Question: if you're such a Professor Moriartyesque mastermind, why can't you employ a goon who actually knows how to fight? Hemlock's girlfriend, sort of, is a black female agent named....sigh....Jemimah. She seduces him and steals his money, which is how all good relationships start. Then he gives her a condescending lecture on the immortality of her actions, which had me holding my head in dismay. Dude, YOU KILL PEOPLE FOR A LIVING, AND YOU'RE GIVING MORALITY LESSONS? NOW THAT'S WHAT I CALL INVOLUTED. After killing several unimportant people, Hemlock discovers that his mystery target is a mountain-climber going up with an expedition to best the Eiger, a man-eating pile o'rock in the Swiss Alps. Since Hemlock twice failed to conquer the Eiger, he's naturally intrigued. He can combine his two hobbies and take a vacation to Europe all at once. But first he has to get in shape, and since this takes half the movie, it's worth noting. Eastwood's old friend George Kennedy trains him at his remote desert resort in Arizona. While Hemlock follows George, his female Indian mountain guide, around on endless runs up sheer rock, he runs into Mello, an effete, foppish ex-mercenary now emeshed in the drug trade, who left Hemlock for dead in the jungle years ago. Poor Mello, played by Jack Cassidy, is one of those unfortunate characters who always appear in Eastwood films, whose express purpose is to be humiliated over and over again and then get killed. Like Dragon, Mello employs a bodyguard who can't fight and ends up blubbering for his life in the middle of the desert. The scene is played for laughs, but I didn't find it funny, or realistic. Hemlock drives the guy at gunpoint into the Mojave desert and leaves him to die of thirst and heat stroke? You gotta be kidding. First of all, if Mello really was an ex-special forces drug kingpin, he'd hardly be the floppy-wristed wuss Cassidy is forced to portray. Second, he'd be carrying a damn gun himself, instead of a poodle and a pack of cigarettes. I've met a lot of SF guys in my life, and none of 'em ever lisped, "You let ME choose the wine!" Having prepped himself, Eastwood heads for the Eiger while trying to puzzle out which of his team-mates he's got to kill. He also beats up Pope again, for using an unpleasant phrase to describe Jemimah. Once again, let us behold the hypocrisy: the murderer for hire stands up for racial justice. Finally, and by this time you've worn quite a groove in your couch and are probably on like your ninth beer, they climb the mountain, and the real fun begins. Will Eastwood get his man? Will Eastwood even survive the climb? Do you care, considering he's playing a sadistic button-man with a superiority complex? A Great Oldie -- But Is It An Edited Version? I could swear that there were a couple of different scenes when I saw this film in theatrical release. There was at least one more scene in the Eiger Hotel where Pope confronts Eastwood, and Eastwood slams his hand in the door. That explains the extra irony when Eastwood later steps on Pope's hand in their outdoor fight, and Pope cries out "ow, my hand, my hand!". Also, the scene where the little dog jumped into Eastwood's jeep in the desert was omitted in the original. Instead, when George Kennedy later informs Eastwood that the county sheriff has found Milo's body in the desert, he concludes with: "...and the damnedest thing..." "What's that?" "They say that he ate a dog" to which Eastwood returns his best insouciant smile. I could see that they might have taken that out for today's animal-rights PC-crowd. Which means that they must have filmed both versions and used the more rude one in the original release. Does anyone else remember it that way?